If you’ve read my blog for any length of time at all, you will know that I am a big fan of jazz music. I was ripping a Buddy Rich jazz LP from 1972 to mp3 when a familiar tune came on. Sure enough, the song was “That’s Enough” which was recorded back in the mid ’60s by Jake Hess and The Imperials. Jake later recorded the song with Terry Bradshaw and also with the Talley Trio. 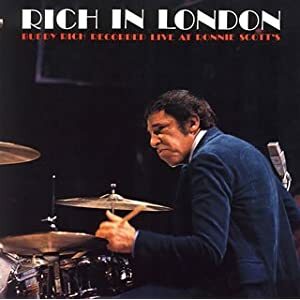 This recording by Buddy Rich and his big band actually features a female vocal trio, led by Buddy’s daughter Kathy. It’s a pure big band jazz arrangement, and it’s VERY VERY good. You just never know where a SG song will turn up! News broke over the weekend that Brian Alvey, who recently married Lauren Talley, will be joining the Talley Trio on stage, making the trio an unconventional quartet. Daniel Mount has an interview with Roger Talley that does a good job of hitting the main logistics of the change. The group will be rebranding itself as The Talleys from the Talley Trio. While the vocal configuration is not exactly the traditional voicings of a mixed quartet, Roger Talley is a masterful arranger, and I expect him to be able to take full advantage of the voices to create a unique sound. They are targeting September 1st for the debut of the new sound, and this fall will begin work on a new “quartet” project with the new lineup. With Roger at the creative helm, hang on folks, this could get real good real quick! Though the official CD release dates are not until later on (Aug. 15 for the Kingsmen, Oct. 15 for the Talley Trio), both the Kingsmen’s Missing People and the Talley Trio’s Songs You Know By Heart are now available for download on Crossroads’ site. Find the Kingsmen project here and the Talley Trio project here. As the disclaimer states, the Talley Trio project is officially available for pre-order, but the digital version is already there. According to this comment on AVFL, the Talley Trio’s “Life Goes On” will be #1 in June. This is the title track to the group’s latest album, and is a great song. It’s also notable that this makes the 10th song to hit #1 for the group, and the third straight single. Congrats to the Talley Trio, the Life Goes On project was one of the strongest of the year in 2008. I’ve taken the opportunity to revisit the albums that I’ve personally heard and/or reviewed this year, and compiled a list of the top 10 songs that were released on albums this year. This list has NOTHING to do with chart action, or albums recorded in 2007 or earlier, but is solely a list of the 10 best songs I’ve heard on albums this year. I’d dare say this list makes a pretty decent compilation. It’s hard to narrow down these songs, but these 10 have all stood out to me as songs that have knocked my socks off when I heard them. I could very easily come up with another 5-6 that are probably just as deserving to be in this list, but this is my personal top 10 at this point in time. These are 5 excellent albums, and each has its own merit. You can’t go wrong with any of these projects.